Mt Fujisan, a most sacred spot to the Japanese, and the stuff that legends are made of. They say that when Mt Fuji emerges from beneath the almost ever-present clouds and mist and chooses to reveal itself to you, then good luck will come your way. Staying on Lake Kawaguchiko in the Mt Fuji Five Lakes area was hopefully going to afford me that elusive clear view, and it did – pictureperfect for three mornings in a row. Good luck was indeed imminent. Reports then began to circulate of a supertyphoon headed Japan’s way, expected to hit particularly hard in the Mt Fuji Five Lakes area. As the rain increased, we bought in groceries, worked out an evacuation plan from the little Japanese inn on the lake where we were staying, and battened down the hatches for the night. The typhoon was estimated to hit at 6am the following day, and so a very restless and worrying night ensued. At just after 5am on the big morning the day somehow seemed to be breaking clear and calm, and birdsong greeted us. How could that be? As we pondered the whereabouts of the typhoon and took in the unexpected magic of the lake scene outside our window, the sky broke to unveil a scene worthy of a science fiction movie. 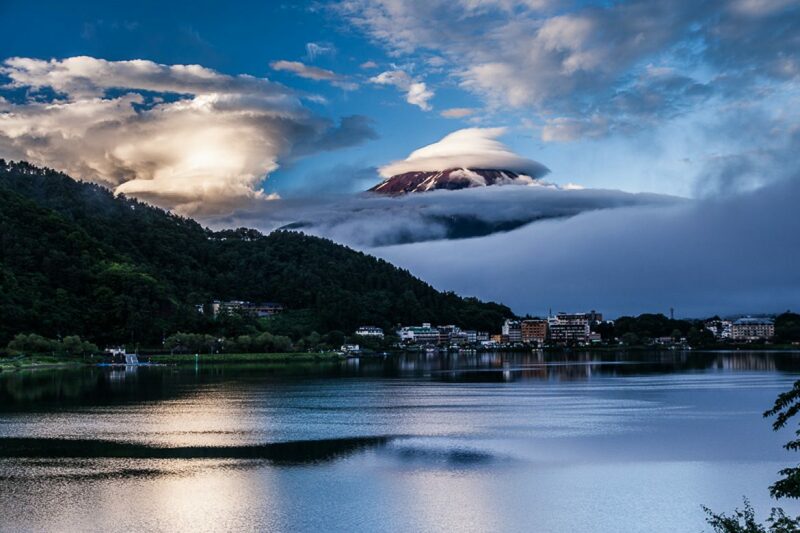 Suspended mid-sky was a helmeted Mt Fuji, the peak circled by a crazy cloud garland and the base hidden totally beneath a cloud layer. For all the world the glorious mountain had transformed into a spaceship – just for a few short minutes but enough to let us know that we were witnessing something extremely special. The tough typhoon conditions obviously surrounding Fuji gave us a double gift – the knowledge that the storm had bypassed our area after all, translated itself into a vision so splendid and unique that it brought tears to my eyes. If I were to live another dozen lifetimes I am sure that this scene would simply not repeat itself, and I feel privileged beyond words to have witnessed it. So impactful was this vision for me that a second image of the phenomenon has been included in the website gallery entitled “Japan – in Summer”.